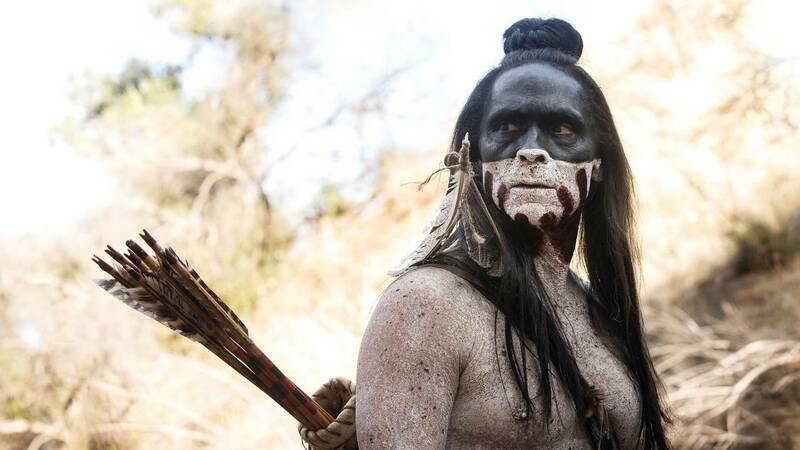 By the end of Westworld’s second episode, we have a pretty good grasp of how the park functions, or at least how it’s supposed to function. High paying guests are transported to Delos headquarters, where they are dressed in their Western garb and then whisked into the park, at which point they are free to pursue all guilty pleasures their hearts desire, under the guarantee of safety and protection from any physical harm. However, we’re now aware that there seems to be an issue with a recent coding update, causing some hosts to recall previous builds, and in response either malfunctioning (like Peter Abernathy [Louis Herthum]) or lashing out in uncharacteristic ways (like Walter [Timothy Lee DePriest]). “The Stray” continues to build upon this sense that something is definitely not right within the park. 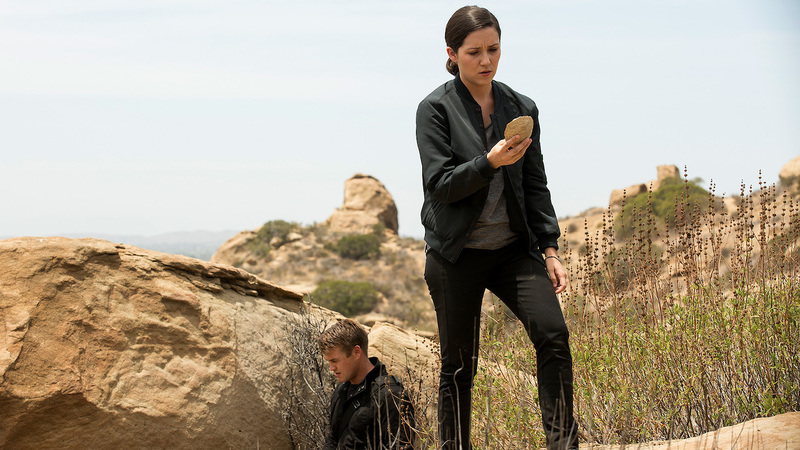 Among the various storylines, Elsie (Shannon Woodward) and Stubbs (Luke Hemsworth) are called upon to track down the vectoring Woodcutter (Tait Fletcher). Wyatt’s (Sorin Brouwers) story is uploaded into Teddy (James Marsden) as the source anchoring his painful, and up to this point unknown, backstory. And the mysterious Arnold is described to Bernard (Jeffrey Wright) as Dr. Ford’s (Anthony Hopkins) late partner and the co-creator of the fantasy park and its inhabitants. Both Elsie and Stubbs have predominant roles in this episode, mostly thanks to the mission they are tasked with to track down and capture the straying Woodcutter. When the Woodcutter problem is first discovered, Elsie and Bernard (Jeffrey Wright) are reviewing footage of Walter mercilessly killing six hosts in a saloon the evening before. Whilst doing so, Walter at one point exclaims, “I need more milk, Arnold!” Elsie and Bernard are both baffled at this statement, neither knowing who this mysterious Arnold figure is. I can’t help but think this uncharacteristic response from Bernard is actually a pre-programmed response courtesy of Ford, designed to shoo Elsie away from the scent she has picked up. This design could serve to keep the human Delos employees like Elsie far away from Ford’s ultimate plan, and therefore less likely to put up a fight as he rolls out the last stages of his final narrative. Later on in the episode, when Elsie and Stubbs have embarked on their journey to locate the Woodcutter, they stumble upon the stray’s tent, where they find various woodcarvings. Elsie notices a particular pattern carved into the back of a few of these statuettes, which she later, with help of Stubbs, realizes are carvings of the constellation Orion. In Greek mythology, Orion is described as a huntsman, and the son of Poseidon and Euryale. The legend of Orion has many different stories attached to it, but one in particular tells the tale of how Orion becomes a constellation. According to the story, Orion sets out on a hunt with Artemis and her mother Leto, and during this time he exclaims that he will kill every beast on Earth. In response, Mother Earth sends a giant scorpion to kill the hunter, which succeeds in doing so. Zeus eventually places Orion among the constellations as a tribute to the late hunter. While arguably a stretch, could the show’s reference to Orion be foreshadowing the eventual host uprising? Perhaps Orion himself is a metaphor for the conscious and vengeful hosts, and the beasts destined for certain death are the helpless Delos employees and shareholders? 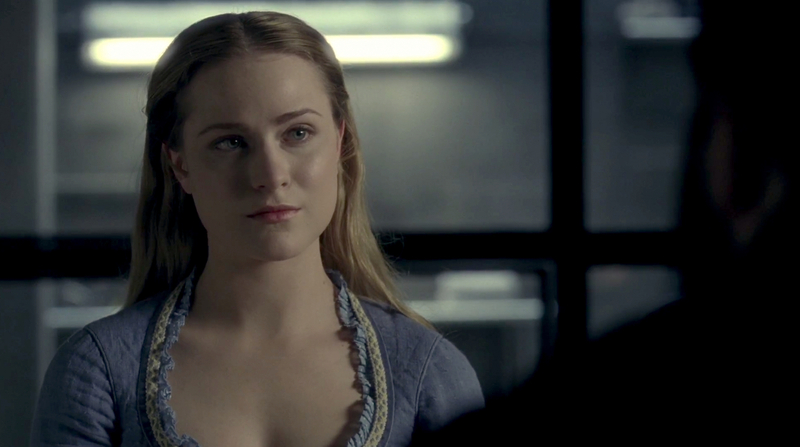 Dolores (Evan Rachel Wood) is also heavily featured in this episode, particularly during two major conversations she has with the person we now know is Arnold. In this particular passage, Alice seems to be questioning her own reality, and who she is within it. This ability to question one’s own being is certainly a product of consciousness and self-awareness, which we know is Arnold’s ultimate goal for the hosts. Could he be trying to tell Dolores through this passage of what he hopes will become of her, or could he even be coaxing her to progress? The duo’s second encounter finds Arnold in a bit of a panic, seemingly because he is worried of what would happen should the hosts realize in their state of consciousness that they’re trapped in a prison. As he questions whether or not to roll Dolores back to a previous build, he can’t help but admit to her: “This place you live in. It’s a terrible place for you.” That it certainly is! This interaction is a turning point and breathes confidence in Arnold, who has now witnessed his android creation claiming that she will “discover” who she is and will one day “be free.” Whatever doubt Arnold has in his quest to free the hosts from their own mental prisons has vanished, and he is now determined to move forward. Bernard’s journey through this episode is an important one. Not only does both he, and the audience, learn who exactly Arnold was in relation to Dr. Ford, but we also witness him talk to who we assume is his wife (Gina Torres) about their dead son Charlie (Paul-Mikel Williams). 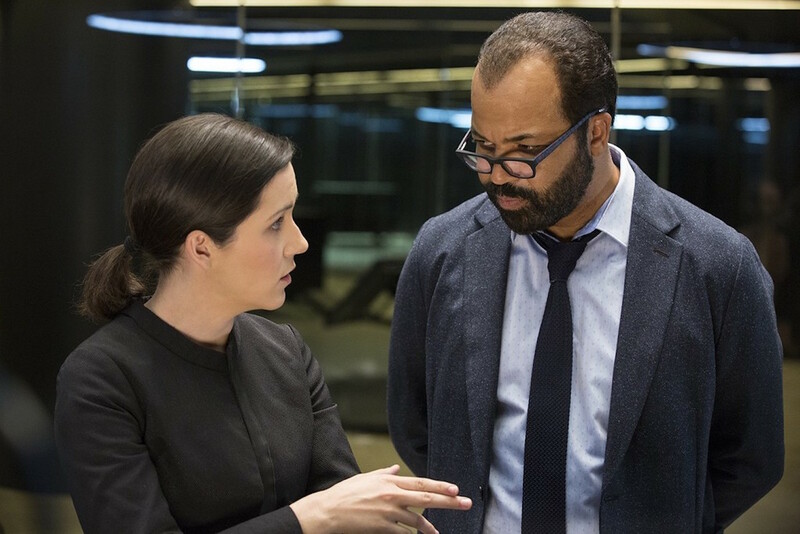 Bernard’s conversation with Ford about Arnold is important in the sense that Bernard is essentially (and unknowingly) learning about himself in his previous human life. When I watched this encounter the first time, I was obviously unaware that Bernard was learning about his human counterpart. But to watch it a second time with the knowledge of Bernard’s former identity – the conversation took on quite a different meaning. As Bernard is leaving Ford’s office after this conversation, Ford has a few last words for him: “Just don’t forget: the hosts are not real. They’re not conscious. You mustn’t make Arnold’s mistake.” Bernard responds in a confused manner, “Why would I?” Well, I think it’s pretty clear why at this point! In the next scene, Bernard is video chatting with a woman that we assume to be wife. The two begin talking about their late son, Charlie, who Dr. Ford first brings up in the previous scene as he and Bernard are talking (“Well forgive me, but I know the death of your son Charlie still weighs heavily on you”). 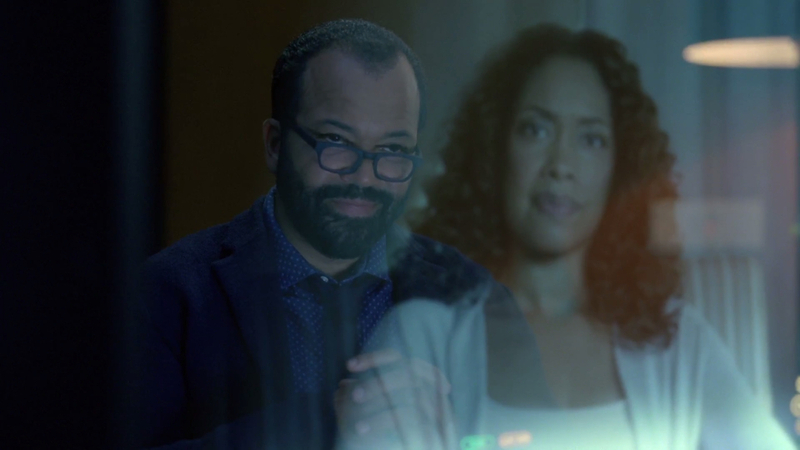 Although we learn later on in the season that Bernard’s wife and son are not real, and instead are just figments in his artificial backstory, this conversation is important in the sense that it allows the audience to see the emotional effect the programmed memories have on him. 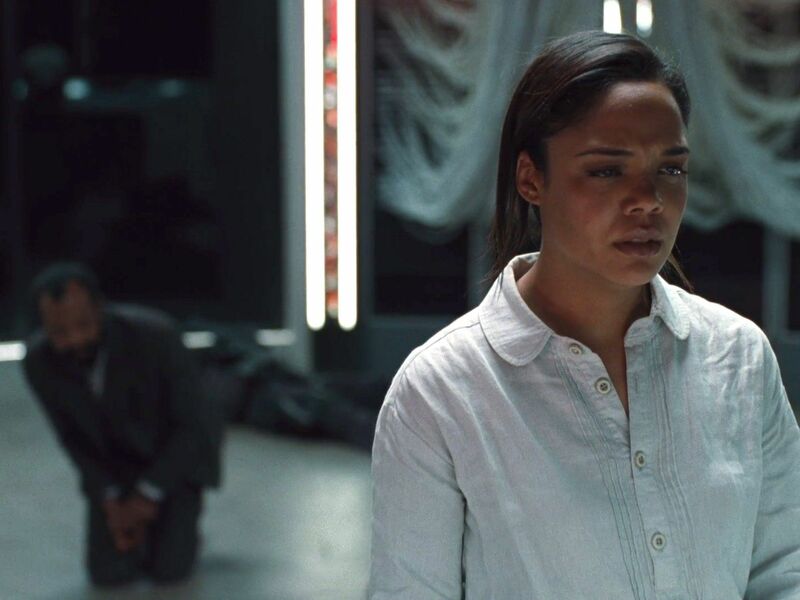 The episode ends with a bang, literally, and once again instills in the audience that Dolores is progressing towards consciousness. She arrives at her farmhouse in the evening to find Rebus (Steven Ogg) and his band of misfits terrorizing her family. Upon her arrival, Rebus takes a particular liking to her, and drags her into the barn, throwing her against a mountain of hay. Her hand then emerges with a gun in it, pointed straight at him. While she initially has trouble firing the weapon, a sudden flashback to the Man in Black (Ed Harris) approaching her with a knife while her inner monologue (composed of her and Arnold’s voices) tells her “kill him” is all she needs to pull the trigger and kill, for the first time. The last scene sees a wary Dolores stumbling into William (Jimmi Simpson) and Logan’s (Ben Barnes) camp sight, before collapsing into William’s arms. What do you think of this episode? Do you have any additional thoughts that aren’t covered above? Let us know! Still makes me laugh, all these re-watches later. It’s ridiculous, but sort of the right kind of ridiculous. It may be a forlorn hope, but I hope the AI gods smile upon us and we (somehow) get some more Elsie-Stubbs misadventures in Season 2. I wholeheartedly agree! The Elsie-Stubbs dynamic certainly provides a welcome bit of humor among the drama of the show. Plus the two actors seem to play off each other so well. Here’s to hoping for more!